One of the hardest questions to answer in our industry surrounds the issue of what qualities differentiate a ‘good’ programmer from the rest? I just read Eran Galperin’s “What makes a good programmer?” post on the subject today, and thought that I would share my list of those essential skills and traits that I would look for in anyone on my team. It’s always been the case that you need flexible developers on your team, but at no other time in the short history of software development has it been so important. If you’re usually the person that does the UI coding, we’ll want you to dig into the persistence layer. We might even want you to go do some testing, which you’d usually run a mile from. You may have been hired as a Java programmer, but we want you to write our next application in .NET, and maybe it’s best to accept that. It’s the world we live in, and you’ll be all the better for it. Multi-tasking is as important as being an expert in one narrow field. At the time it might not be pleasant, but your CV will impress as your next employer sees what you’re willing to do. Maybe you went to university and studied computer science because you heard that was where the money is. A few years in, maybe it was not as rewarding as you expected, and you start getting disillusioned. A great programmer will lovecoding – maybe not the code their working on right now – but in general you should be someone who enjoys building something to solve a problem for someone. When you get a chance to have a cup of coffee at the desk you’ll be going to sites like JavaLobby, and finding how to improve. When you hear about Google’s latest move, or the newest web framework that everyone’s talking about you’re interested. After all, why wouldn’t you be – any ripples in the software development and IT landscape are going to reach you eventually. The Pragmatic Programmer is one of the most important books in the software industry. Not only is it timeless in the way that it doesn’t tie itself down to one language, but it provides a great set of guidelines. Thinking about the consequences of your actions is essential when working in a team, and my favourite metaphor is “No Broken Windows”. Maintain a consistently high standard in all your work – testing, coding and documentation alike – and others are likely to follow your lead. Let that slip however, and things can take a turn for the worse. The best way to stay fresh, despite what programming language is currently in fashion, is to keep thinking scientifically. Any problem can be broken down and all languages have a similar set of a characteristics. While this may be natural to some and not to others, the main thing to do is to keep questioning yourself. Can you write this piece of code better? Could I present this information in a more structured way? Mind you, the answer is almost always yes, so use pragmatism to find a reasonable end to this questioning! When I started programming I would just dive right into my latest task. And that was fine back then, as I was just beginning to get assigned tasks. A few months later, I went to a talk on time-keeping, and learnt a lot that I still utilise today. A good programmer will be well organised, perhaps sitting down at the end of every day to list out the tasks for tomorrow. If someone needs something else done, at least I can refer to this list and see where I can fit it in, or what else will get affected. 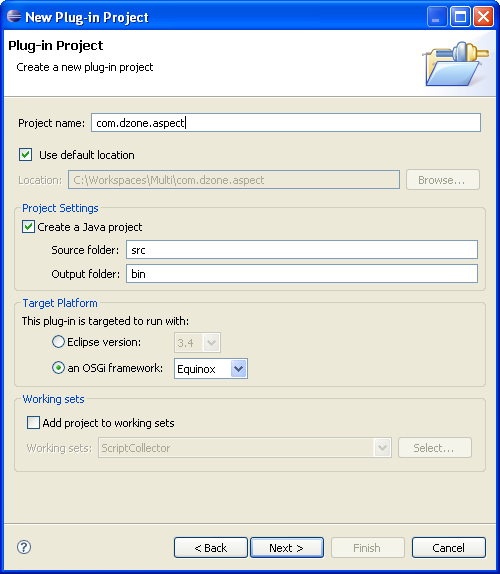 A useful tool for this is Mylyn, a task based Eclipse plugin. It pays to be organised on the code and documentation side of things too. An organised approach to packaging, class and variable naming and design, makes everything much easier to follow for others on your team, and for you when you look back at something after a few months. The majority of us work in team environments, so we have to possess people skills. All the great programmers who have respect are those who are approachable. You need to make time for those who feel they need your help, whether that’s a developer with a code problem or a project manager wondering about your estimates. Along with these skills, you should endeavour to be clear in all your communications – the worst thing that can happen after any meeting is that all parties walk out more confused than before. Being reasonable can’t be underestimated. No matter what your position in the organisation, some negotiation will always be required. Maybe something can’t be done that way you know is right, but in the interests of moving forward, it’s good to be able to find some half-way point, rather than being too head strong. You can’t assume that someone else will tell you what the right thing to do is, and when. Maybe you need to move to the latest version of a framework even if you’re close to a release -especially if you feel there’s some benefit there. If you’re enthusiastic about your job, then you’ve probably been keeping up to date with what’s available. And if you’re flexible, you won’t mind sacrificing part of your lunchtime, or your spare time at home, to prototype and see if it works. Every chance has it’s costs, but all need some investigation rather than charging in blindly – be prepared to take that time. Taking chances applies to your career too. Maybe this new startup is worth joining? Maybe you’re just comfortable in your job right now and you need to challenge yourself. You’ll notice there’s a common theme in any success story – the chance was worth taking, and the chances that were wrong calls help you learn. If there’s one point that you can take away and implement from this article it’s this one. Take pride in what you do. Everything else falls into place, and you will become a great programmer if you take this advice. It’s a lesson learned from all professions – the people we regard as great are those who feel that their industry is the most important, the ones that want to believe that the world needs great programmers. It’s difficult to do if you don’t love programming, but it’s still possible. You’ve to ask why you don’t like your job right now and find ways to address it. If you’re writing tedious code in the day job, maybe joining an open source project will kick off the spark for you again? You can spot developers who take pride in their profession a mile off, from the quality of the code they write, to their enjoyment at being given a difficult task. This is just my opinion, and it doesn’t hit any of the real technical aspects of a developers job. Are there any other points here that I’ve missed that help produce the Über-programmer? From the great developers that you have known, what would you describe as their outstanding traits? Eclipse can make your life really easy when it comes to working with version control systems. Over the next few articles, I’ll be sharing some of the tips that I’ve picked up while using Eclipse (with CVS). When you make changes in your local workspace, the default decoration is a ‘>’ before the change, up to project level. This is fine, but isn’t particularly obvious when scanning through your workspace. On the general tab, you can change the colors and fonts of anything that has changed locally. First, click through to the Colors & Fonts page. This part of the preferences dialog allows you to customize the colors that are used. Hopefully you’ll find this as useful as I did. Eclipse is my everyday IDE, but I’m sure that similar settings exist in other Java IDEs. If so, please share how to access those capabilities with a response (or another article). The last two days I have been looking at various ways that Eclipse assists developers when working with version control systems. First, we talked about highlighting local changes, then we discussed how to automatically synchronize with the version control system. Todays tip deals with Change Sets, which is themost useful feature in Eclipse for seeing real context behind changes in version control. To view change sets, you can synchronize as normal but by making a few changes to your Synchronize view, everything looks brighter. Once this is chosen you’ll see all changes in the batches that they were committed in. The name of each change set will be whatever the author used as the commit comment, or if they explicitly create their own change set, it will use the change set title. You can create your own change set by clicking on the changes in the synchronize view and choosing Add To> New Change Set. Of course the neatest way of managing your change sets would be to use Mylyn, but we’ll cover that in another article. Using the change sets view while synchronizing automatically makes viewing the differences between your local workspace and CVS simple. Over the course of your workday, you should find yourself synchronizing with your version control system frequently. After all, you need to see when somebody’s made a change, and the sooner you know, the sooner you can integrate that change locally before committing. Once again, Eclipse has a really easy way to schedule your syncs. Everything you need is on the Synchronize view (Window/Show View/Team/Synchronize). From there, you can synchronize which ever projects you want. Click on the synchronize menu (highlighted in red below) and choose Schedule. Here you can set the frequency of the synchronization. You can also use the Synchronize Preferences dialog to ensure that when you start up Eclipse, that the sync is triggered automatically. Put this together with yesterday’s tip and you have much better visibility into what’s going on in version control vs your own workspace. Tomorrows article will add a final piece that makes teamworking with Eclipse much easier. Last week I wrote a few articles on how Eclipse can assist when working in team environments. Today, I have another Eclipse related tip – this time to do with how you organise your local workspace. Developers will typically have a number of projects in their workspace at any one time. If you’re working with a plug-in/OSGi system, the number of projects can be huge. So one of the best ways to reduce the workspace noise is to move to working sets. Typically your projects can be grouped into categories, whether that’s functional or feature related. 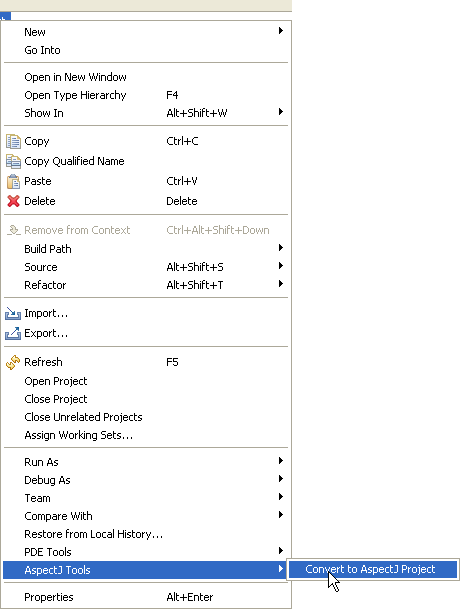 Choosing Working Sets as your package explorer view, you can group your projects into these sets. And using the Configure Working Sets option, you can even choose which working sets to display at any time. From this view you can edit working sets to choose what projects to include. You can also right click on a project at any time and using the Assign Working Sets menu option, send it to one (or many) working sets. The new project/import project wizards even allow you to assign the new addition to your workspace to a working set immediately. It’s all pretty simple, but when I first found this feature it really helped me clear up how I worked. Hopefully it’s useful to you too. If you’re using Eclipse as your IDE every day, you’ve probably got certain tasks that you do regularly such as getting projects from version control or writing unit tests, as well as normal coding tasks. This tip shows how you can customize what shows up on your File/New menu for a certain perspective. Some of the commands that you use might be buried under the File/New/Other.. menu. This brings them up a level. To do this, go to Customize Perspective from the Window menu in Eclipse, while in the perspective where you want the changes to apply. Here, you will see a number of options that you can add to the New menu. Note that you can also customize shortcuts for the Show View and Open Perspective menus from here. Just select the items that you want to appear. In the above example, I’ve included the JUnit shortcuts. It’s a pretty simple thing to do, but it might save you a little bit of time. A common observation of the software development industry is that it’s immature. And that’s true when compared with more established professions related to construction or medicine. I’ve been thinking that this may be due, in no small way, to the way software developers are treated, which Neil McAllister outlines in his article Developer Burnout: Time To End The Disposable Geek Mentality. Long work hours, missed vacation and sick time, and lack of recognition and advancement are endemic in the software development industry. For all the talk of a “knowledge economy,” some of the smartest and most highly specialized members of the workforce are often treated like disposable labor, easily replaced by newer, cheaper recruits. The result, predictably, is burnout, where the most seasoned team members leave the organization for greener pastures — and or vacate the field completely. Every sofware developer with a year or two’s experience has served their fair share of crunch time. There’s always something else that needs to be done, deadlines are a constant squeeze and the result is a worn out workforce. And what’s next once the deadline is reached? More of the same. Sure, managers can do stuff to help out here by allowing key developers to take some time out from the critical path. But usually, the key people are the ones that are always busy. Does taking an agile approach improves things? Yes, but the same demands on the software developer persist. The thing is, I’m not sure why this is the case, or what could change things. Perhaps software development isn’t looked at as the highly skilled profession that it really is? I know, unlike doctors, we’re not saving lives (for the most of us at least), but with IT at the center of everything, surely developers should be more valued? Maybe I’m wrong, but the broad consensus seems to suggest that software developers aren’t treated as well as they should be. Have you got any horror stories that support this claim? 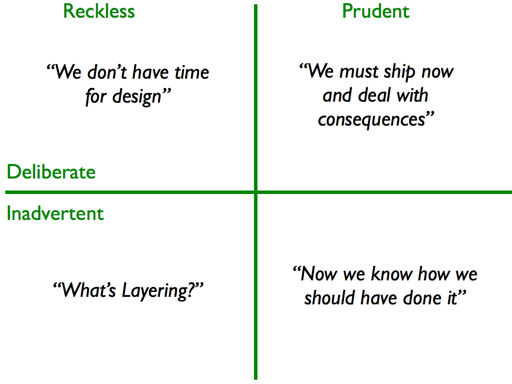 Have You Found Your Project In Technical Debt? I’ve been reading a lot about technical debt recently where people alternate between voluntary technical debt or inadvertant debt. Without doubt, every project has some level of debt, but the important thing is how much do you have, and when do you plan on paying it off. Technical debt is an excellent way for an architect or developer to communicate the cost that a particular decision or implementation made in the short term will affect the project in the longer term. While in words this works fine, I wonder if there is some type of formula that we can apply to illustrate and track the debt of a project. For each item in the project that causes some debt, it needs to have interest (the cost of not addressing it) and principle (the cost of refactoring the issue to make it work). While principle could be the number of man days to fix it, I’m stuck with how to express the interest. And how do you work out how much technical debt a project can actually afford. I’m interested to hear if any of you have used the technical debt metaphor in your projects effectively? The cost of racing making the deadline at all costs. Once it runs it’s ok right? Creating a mess without noticing that they’ve done so. Without bringing in any design patterns or real knowledge/experience, debt it going to happen, without the team realising how much of a mess they’ve created. “If I was starting again, I’d do it differently”. While things were done to the best of the teams ability, we find that there will be a better way. Voluntary debt. The team knows that it’s not quite right, but it’s better to ship and accept the technical debt that will arise because of this. It seems to me that Aspect Oriented Programming never really took off when it was introduced. However, it’s a useful way to intercept, or analyse, methods as they happen, in an independent way. Eclipse has a useful suite of AspectJ tools that you can download for your Eclipse installlation. Paired with the benefits of Eclipse’s plug-in system, aspects are a nice way of intercepting your RCP application. A you write your AspectJ code, you will be advising another plug-in (for example org.eclipse.jdt.junit) You’ll need to do some extra setup in order to advise other plug-ins, by adding the following to your Aspect plug-in manifest.mf. Note you can only supplement one bundle in an aspect. Therefore, if you want to crosscut another bundle, you’ll need to create a new AspectJ plug-in. It’s as simple as that. Have you any instructions to add to this? One of the most important developer activities is debugging. In my college days, we were forced to use simple text editors for our software development, so I started out using print statements to see where my code was going wrong. These days, we have the comfort of IDEs, but debugging remains one of those talents that you get more efficient at with experience. Let’s say that I want to see the values of all the variables when the employee’s getType value is Employee.DEVELOPER, and step through to make sure that we don’t enter the if statement block. As you type in the condition you get full content assist. You can also change what this condition means – whether to stop when it’s true, or when it changes since the last iteration. Things like this can really help speed up your debugging – when you know a particular value has caused your program to fail, you can get right to the heart of the matter. This site runs on the required+ Foundation Theme. Based on the awesome Foundation Framework by the humble folks at ZURB.